AFTER.......REGENCY LRI3E GAS INSERT with black Vignette faceplate, custom 4 sided backing plate and rustic brown brick panels. Gas units are the perfect combination of function and beauty. Cut your heating bills by turning your furnace way down in most rooms and enjoy high efficiency, controllable heat in the livings areas you spend time in. Gas units offer the most in the way of options. Choose from logs, driftwood, firebeads or cystals. Choose seamless, glass, stainless or black faceplates. From traditional to contemporary, there is a design for everyone! Enjoy peace of mind even during power outages, gas units can operate without electricity. Please click on the manufactures website for more information. We have many units on display in our showroom. The direct vent gas fireplaces can be placed on any outside wall. 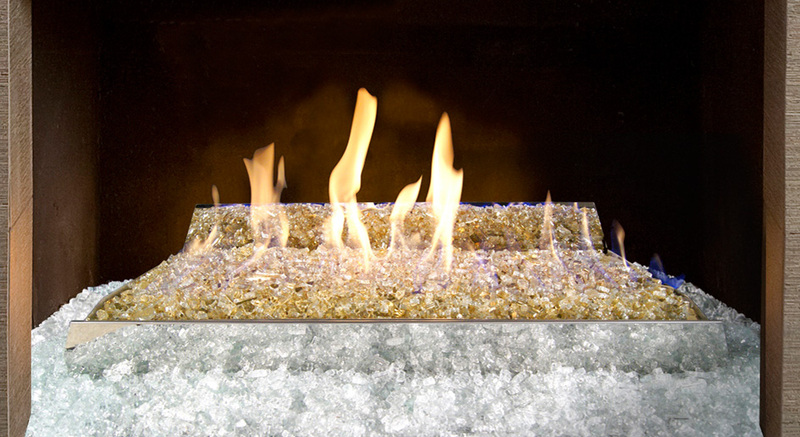 Gas fireplaces come with impressive viewing areas, and many options and sizes. Once you pick out a gas fireplace, it will get framed in and you choose how you want to finish around it. Direct vent gas stoves can be placed on any outside wall. They often mirror a woodstove with all the convenience of gas. Warm up your kitchen, bedroom or den as you lower your heating bills. Gas stoves come in different sizes and styles. The direct vent gas inserts fit into masonry brick fireplace and sometimes into zero clearance wood fireplace. There are many sizes and faceplates to choose from. Gas inserts are a complete fireplace system that can turn your existing wood fireplace into a high efficiency, clean burning gas heater. Gas logs are designed to be put in your masonry brick fireplace and/or zero clearance wood fireplaces. There are Vented and Vent-Free Logs. Vented Logs are used with the damper open, while most heat escapes. Burning vented logs are pretty, but little heat. Vent-Free logs are used with the damper closed. Now, most of the heat stays in your room. However, there may be some odor and can not be used for long periods of time. Please note that we do not run the gas line. A plumber can do this. We install and run the venting for all units we sell. Gary will be happy to work with your contractor for framing and finishing gas fireplaces. Usually all the above gas options come with a remote control for easy convenience. CLICK ON BRANDS BELOW FOR MORE INFORMATION!